When you think of the ubiquitous chicken wing, you usually think of sports bars and chain restaurants but every now and then, you find someone who really steps up their chicken wing game! And that, my friends, is what Heavenly Buffaloes is all about. 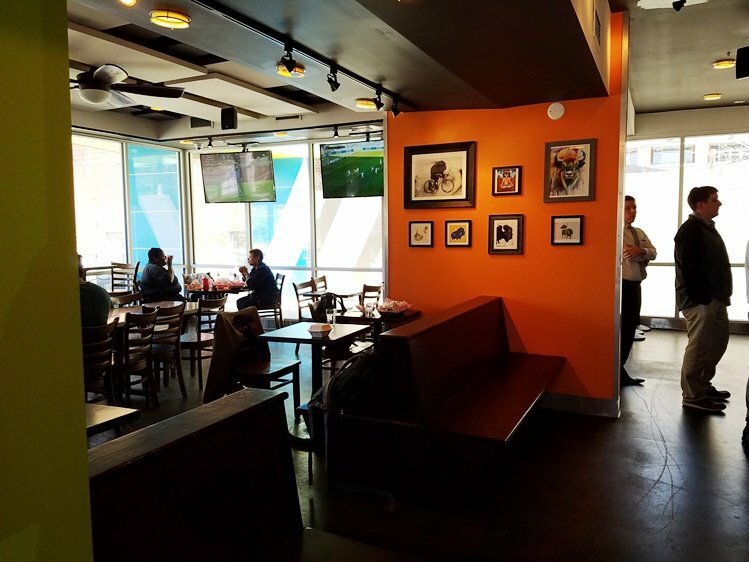 The first and original Heavenly Buffaloes was quietly opened up back in 2014 and people loved their wings. 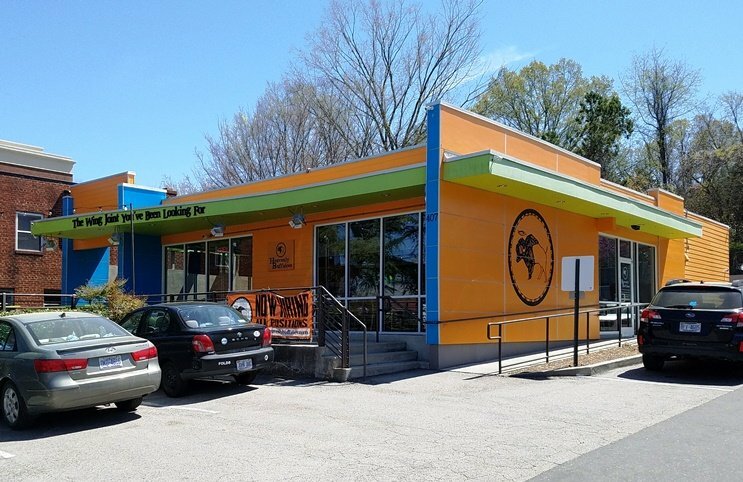 But as a tiny, take-out only spot, I admit that I only ate there a couple of times as much as I like my wings. Fast-forward to 2018 and Heavenly Buffaloes is now opening up it second location in downtown Chapel Hill, hooray! And believe it or not, there will be seating in this location. So of course it’s now time to get my wings on at the new Franklin Street location of Heavenly Buffaloes! 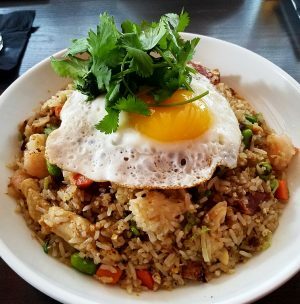 Oftentimes when I review a restaurant, I try to give hints on how to find the place but you will have NO problems finding Heavenly Buffaloes Chapel Hill! Decked out in near-fluorescent orange, green and blue, this brightly colored location will beckon to you from the street. 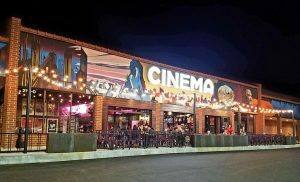 A covered patio up front and inside, Heavenly Buffaloes strikes a balance between quick-casual restaurant and sports bar with a handful of screens tuned to the latest sports. And no surprise, there’s a decent line inside since it’s opening week! The one good thing about there being a line is that you get to review the Heavenly Buffaloes menu that’s on the wall. 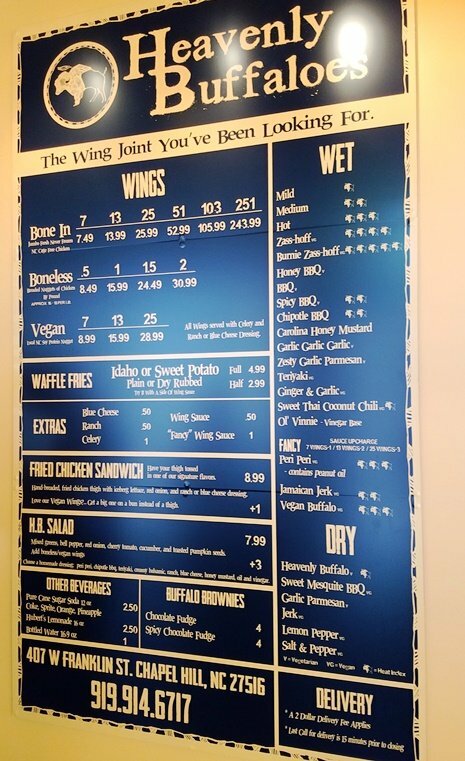 While the menu is simple: wings, waffle fries, chicken sandwich and salad, there are about 20+ choices for wet wing sauces and another 6 dry rubs. So you’ve got some decisions to make, my friend! The standard bone-in wings come in odd increments of 7, 13, 25, 51 103 and 251 (Party! Party!) 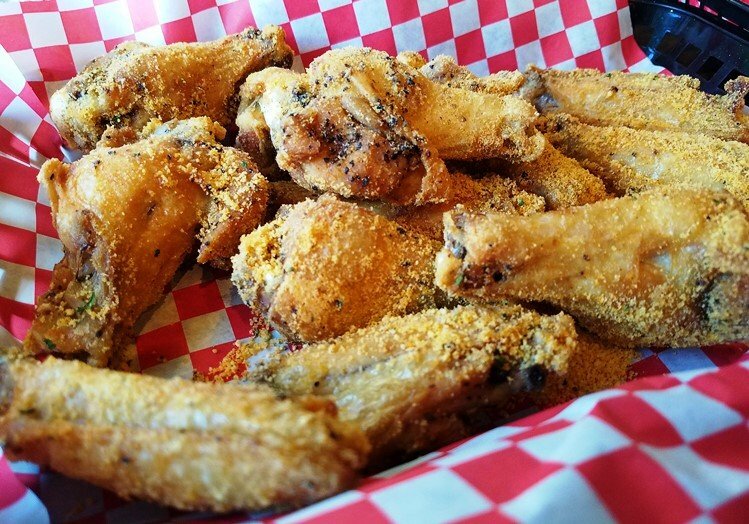 and prices are consistent over different quantities, a little over a $1 per wing. If you want to mix and try out multiple flavors, I’d recommend doing multiples of 7 wings given the pricing. For my first visit, I order up the garlic parmesan dry rub along with a small order of waffle fries. Extra blue cheese, ranch or sauce is .50 per cup. I’d have to say the menu here is pretty quirky overall at Heavenly Buffaloes! Waiting for my food is a bit tough. 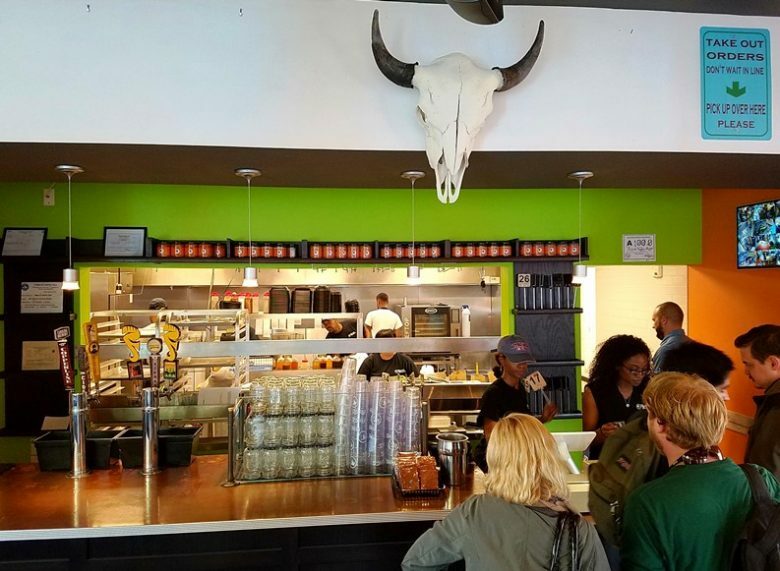 Heavenly Buffaloes is pretty busy and I’m sure they’re still working out the kinks to their operations so my food takes 20+ minutes to come out. I get two baskets lined with red and white checked paper for my wings and fries. Heavenly Buffaloes’ wings look awesome! I’ve got a good mix of drums and flats in my basket and they are well coated with the dry rub. Heavenly Buffaloes obviously uses high quality chicken and they are meaty pieces raised on local farms according to their website. I take a bite and the wings are certainly a bit crispy with the dry rub. The garlic-parm dry rub is solid and not over-powering but I am a garlic fiend and would have like more flavor! 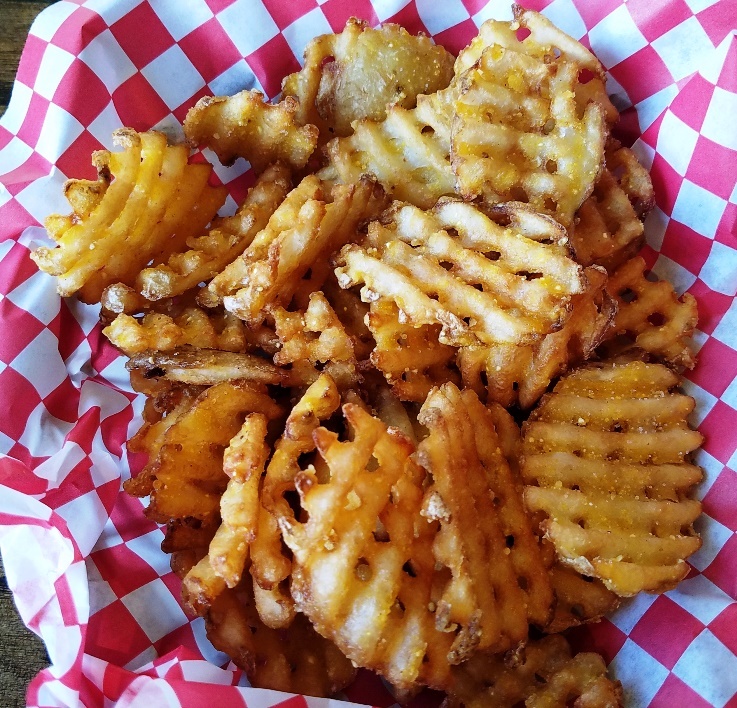 And while the chicken is really good here, I’m even more enthused about the waffle fries which are nice and crisp with a tender interior. 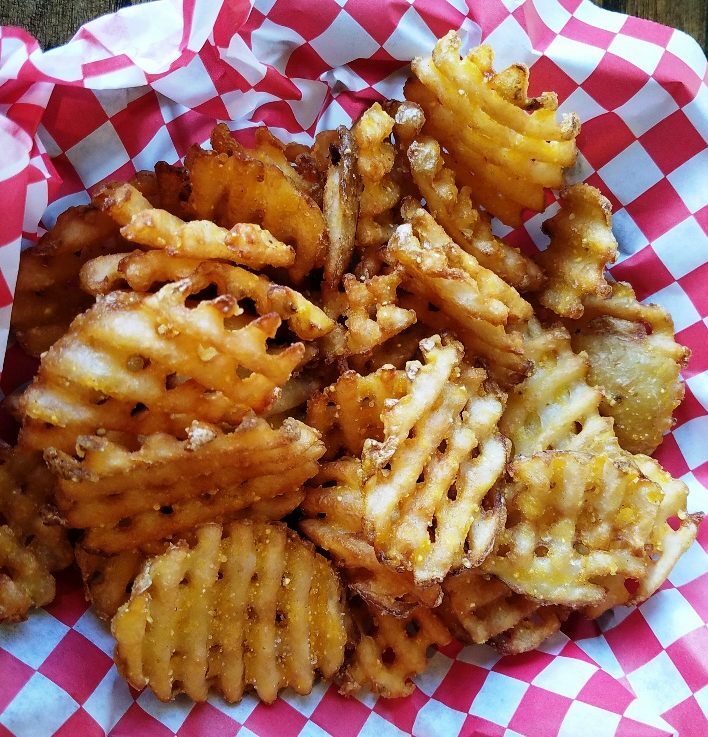 I go with the basic Idaho potato waffle fries but note there’s no ketchup on the tables. You’ll have to request it from a manager or order some side-sauce for some dipping. Overall I still like Heavenly Buffaloes a lot. They do one thing and do it very well. Heavenly Buffaloes is certainly not inexpensive and you can’t be in a rush for your food since it’s cooked to order. 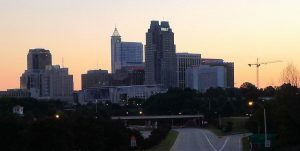 But for sure, the wings here are some of the best you can find in the Triangle so when you’re in the mood, you’ve now got a second great location in the Triangle to get your wings on! Enjoy….